First, just a reminder that Sunday, November 28th, 2010, is our monthly exercise in folly, Savoy Cocktail Book Night at Alembic Bar. If any of the cocktails on this blog have captured your fancy, stop by after 6 and allow the skilled bartenders (and me) to make them for you. It is always a fun time. Like the Victor Cocktail, you just kind of wonder what the Gin is doing in this cocktail. Does it have an intended flavor contribution to the cocktail, or is it just an extender for the rather expensive other spirits in the drink. 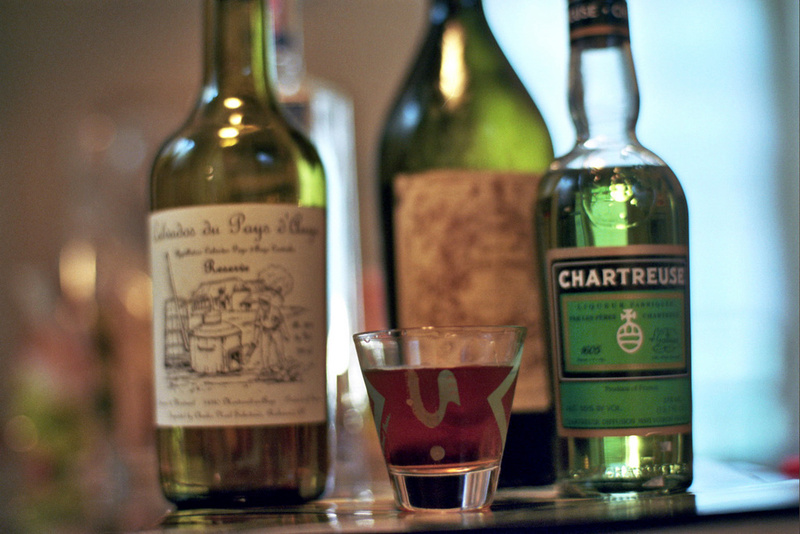 In the case of the Warday’s, I think it does have a bit of a function, providing a bridge between the flavor of the Calvados and that of the Chartreuse, but I bet this cocktail would be even better with Aquavit! The challenge this month is to bring to light a drink that you think deserves to be resurrected from the past, and placed back into the spotlight. It could be pre-prohibition, post-war, that horrible decade known as the 80?s, it doesn’t really matter. As long as it is somewhat obscure, post it up. If possible try to keep to ingredients that are somewhat readily available. While we all appreciate the discovery of an amazing cocktail, if we can’t make it, it’s no fun for anyone. Not sure if this is quite cool enough to be a truly awesome “Forgotten Cocktail”, but it is quite tasty, and as far as I can tell obscure enough to be included, especially since contributors in the comments have noted it is very similar to Jeffy Morgenthaler’s Norwegian Wood. Oh, and, apparently a version of the Warday’s is found in regular rotation at the New York City members only club, Milk and Honey. This entry was posted in Savoy Cocktail Book and tagged Calvados, Chartreuse, Cocktails, Dry Gin, Italian Vermouth. Bookmark the permalink. On your mention, I was immediately inclined to try this with aquavit, as I’m enormously fond of Jeffrey Morgenthaler’s Norwegian Wood: applejack, aquavit, sweet vermouth, yellow Chartreuse, and Angostura. Between the two, I’d still opt for the Norwegian Wood over the aquavit Warday’s, but it’s still good enough that I don’t see myself bothering to make it with gin any time soon. Oh right, I make Morgenthaler’s Norwegian Wood. Slightly different proportions, if I remember correctly: 1 oz Apple Brandy; 1 oz Aquavit; 3/4 oz Sweet Vermouth; 1/4 oz Yellow Chartreuse; dash Angostura. Funny, the Norwegian Wood didn’t really occur to me, I just remembered that I liked the combination of Aquavit and Calvados.